Groundbreaking took place for the Operation Finally Home project on Vetaran's Day--November 11, 2011. Standing with his family in the middle of a vast field off a winding, rural Lynnville road, Shaun Meadows said it’s where they plan to spend the rest of their lives. “This is it for us,” Meadows said happily. “We’re done.” The spot off secluded Petty Hollow Road where the Meadows stood Friday will soon be occupied by a one-story, 3,500-square-foot house with three bedrooms and three baths. The house is being provided for the family by Operation Finally Home, a nonprofit organization that donates new, mortgage-free homes to wounded and disabled veterans. The group has joined with Goodall Homes, which will build the house and LP Building Products, which will donate materials for the project. In 2008, Meadows lost both of his legs to an improvised explosive device while serving in Afghanistan. During a year-long stay at Walter Reed Army Medical Center and after being fitted with prosthetics, he learned to walk again within two-and-a-half months and was running after six months. 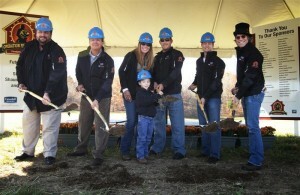 A groundbreaking ceremony for the Meadows’ new home...” which is slated to be built by Memorial Day, "...was held Friday, complete with an appearance by Big Kenny, one-half of the popular country duo Big & Rich. Meadows has a connection with the artist. In September, Meadows parachuted with Big Kenny into a concert headlined by Big & Rich at the Woods Ampitheater at Fontanel in Nashville. It was at that concert where the Meadows family learned they would receive the new house. “We’re very grateful and just humbled by the whole thing,” said Shaun’s wife, Nicole, her eyes filled with tears at Friday’s ceremony. “It’s a total dream.” After Shaun retired from the Air Force in Jan. 2011, he and Nicole, who were both stationed in Washington D.C., were searching for a permanent place to call home. They fell in love with the Lynnville countryside. “It’s gorgeous,” Nicole said. “Giles County is amazing.” Meadows said he learned about Operation Finally Home from a friend in the Air Force. “He told me I should fill out an application, so I did and lo and behold they selected us,” Meadows said. “What an amazing organization; They’ve already built, I believe, over 30 homes for wounded guys.” Meadows was also honored Nov. 6 before a Tennessee Titans home game, when he was selected as the official “12th Titan” to represent the entire Titans fan base. He raised the team flag before the team’s tilt with the Cincinnati Bengals. Before he retired from the military, Meadows became the first active duty double amputee in Air Force history to successfully perform a personal drop when he parachuted with his Air Force team from a C-17 Globemaster III airplane. “I did it because I wanted to jump with my team one more time,” he said. While he’s set to enjoy retirement with Nicole and his 6-year-old son Trevor, Meadows said he’ll take to the air again. “I’m sure I’ll do some more jumps,” he said. (Article compliments of Richard Conn of the Daily Herald--Maury County, TN).